America Square offers superb suites that are available for various types of events up to 250 guests, including team building events, team performance seminars, dinners, conferences and more. All of this comes with a genuine bit of history, such as the original London Wall, (one of the largest construction projects carried out in Roman Britain) running straight through the venue, providing a fascinating and unique feature. 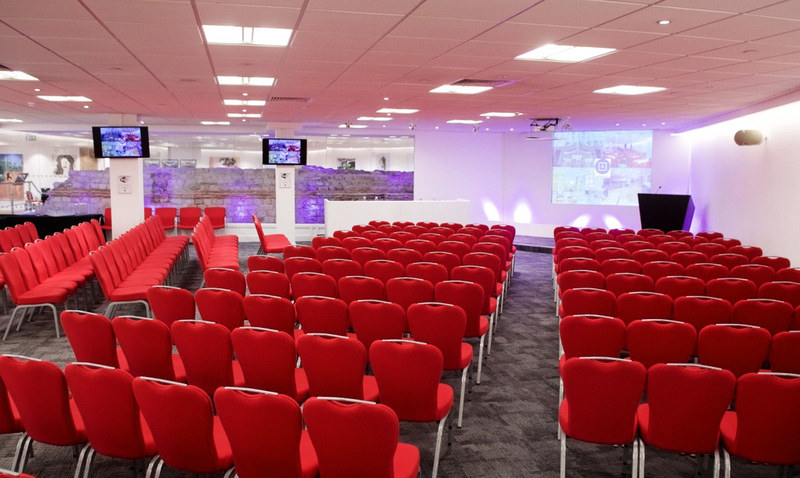 This historic Roman London Wall runs through the venue which provides a highly memorable backdrop to team building events, networking sessions, conferences, exhibitions, product launches, training seminars, dinners and even drinks receptions. America Square is possibly the most perfect venue when it comes to large team building activities. There are also training spaces and executive board rooms available across a series of seven suites, seating between 2 – 270 persons. America Square is an outstanding, complete and modern central London venue. There are excellent branding opportunities available throughout the venue on large plasma screens and via wall projectors. There is an expansive and newly refurbished reception area, making America Square an ideal venue for exclusive team building events ranging from team building activities to awards ceremonies. This multi-award winning venue boasts an outstanding 91% repeat client rate (measured by value). Catering is produced in-house using locally sourced ingredients and their Audio-Visual offering is second to none. America Square venue can cater for a wide variety of professional and team building events and experiences for up to 300 guests in one sitting!